You can install at least 4Gb of memory on most motherboards today, but apparently you shouldn't install more than 3Gb if you're not running a 64-bit operating system. Can't a 32-bit version of Windows (or Linux, or whatever) address 4,294,967,296 bytes (two to the power of 32) of memory, by definition? When I open Task Manager and click the Performance tab, I see the memory limit is way more than 4Gb. I understand that includes the swap file, but if Windows can handle 8Gb or whatever of total memory including swap, why can't it handle 4Gb of physical RAM? The executive summary: Yes, a plain PC running a 32-bit operating system - and if you're wondering if that includes your PC, then it almost definitely does - shouldn't have more than 3Gb of RAM (as I mentioned in passing in this Ask Dan), if you don't want to waste quite a lot of the last gigabyte. NOTE: I originally wrote this in 2007, when 64-bit versions of Windows were quite uncommon. Now that I'm adding this note in 2012, lots of people have Windows 7 PCs that they bought off the shelf and that came with a 64-bit version of the operating system as standard. If you're uncertain, look at "System" in Control Panel. And now, back to the text from 2007! If you install 4Gb, there is no way to make all of the RAM between 3Gb and 4Gb available without installing a 64-bit OS, which you can't do unless you have a 64-bit CPU. And even then it won't necessarily work. So, to avoid hassles on current systems, it's best to stick with 3Gb or less. Fortunately, this isn't a big problem for most people, provided they know about it in advance. Three gigs is enough for even quite serious applications, and it's easy to install on most motherboards (two 1Gb modules, two 512Mb ones). And very nearly all of that three gigabytes will actually be seen by the system. If you want to push the envelope, many new PCs these days are able to run a 64-bit operating system. 64-bit processors used to be weird server-class stuff, but ordinary desktop processors from the AMD Athlon 64 and Intel Core 2 onward (and even late model P4s) can run in 64-bit mode. You have to get a separate version of Windows XP if you want the 64-bit edition, and it probably won't help much with memory limits anyway, as I'll explain in due course. But all of the retail versions of Windows Vista come with both 32 and 64-bit installers. Most PC users, though, are still using 32-bit versions of Windows (or Linux, or whatever). Then, you'll have the same "3Gb barrier" problems no matter what processor you have. To understand why this is, you've got to go back. Way back. Back to the horrible old days of DOS and the 640 kilobyte barrier. Back when PC users only had sixteen-bit operating systems, everybody was wrestling with the memory below the first megabyte line. That was partly because memory was expensive enough that installing whole megabytes of it was a grandiose fantasy, but it was mainly because of limitations that grew out of the cut-price IBM 8086 CPU's mere 20 memory address lines. Two to the power of 20 bytes is one lousy megabyte. And that was the grand total memory address space available to the original PC. A 1Mb memory limit was no big deal at the time, since only very rich people could possibly afford that much RAM, and you couldn't install more than 640 kilobytes in an early PC anyway. The combination of the 640k maximum system memory and the one megabyte address limit, though, led to a design decision to use the memory addresses between 640 kilobytes and 1Mb as an input/output dumping ground for other hardware in the computer. Your old PC's graphics adapter, for instance, had memory on it in which it held the data for whatever was on the screen at the time, and the computer's CPU needed to be able to read and write that memory. So each flavour of graphics adapter was assigned a portion of the 640-to-1024-kilobyte "Upper Memory Area" space as its own, and reads and writes to those addresses did stuff to the graphics adapter's memory. This process is called "memory mapped input/output", or MMIO. This trick was all very well with computers like the original IBM PC, but when people started making PCs that could have more than 640 kilobytes of system memory, that system memory grew up into the addresses reserved for various other hardware. Now new workarounds had to be found if you wanted to find that last few kilobytes to run productivity software or games, and it all became very traumatising and hideous. I apologise to any readers who have now remembered things that cause them to rock back and forth and mumble. Let's fast-forward to the current era. For many years, it's been normal for personal computers to include a Memory Management Unit (MMU). MMUs were expensive add-ons for old computers, but modern CPUs all have one built in. A primary function of an MMU is to allow a computer to have "virtual memory", which in the PC world means "swapping" or "paging" data in and out of however much actual RAM you have as needed, keeping the swapped-out data in a file, or files, on hard drives. Virtual memory is what allows your PC to have more than 4Gb of total memory, including the swap file(s). Memory management lets the computer augment its physical RAM, and lets programs running on that computer feel as if they've each got a simple solid space of memory available to them without treading on each others' toes. But virtual memory doesn't increase the amount of physical RAM you can have. The explanation for the three-to-four-gigabyte problems is that modern computers include an arrangement conceptually similar to the old Upper Memory Area one. Many of the original Upper Memory Area MMIO reserved areas still exist today (for backward-compatibility reasons - otherwise you couldn't install DOS on a new PC), and a few more little ones sprouted above 1Mb as PCs went through their growing pains. Those are preserved today as well. For this reason, a modern "3Gb" computer, which has 3,145,728 kilobytes of physical memory, is only likely to show something like 3,145,192 kilobytes available (look at the Performance tab in the Windows Task Manager, for instance). MMIO ranges "shadow" some of the physical memory, and so the system can't even see that RAM, at the hardware level. 3,145,728 minus 3,145,192 is only a shortfall of 536 kilobytes, though. So this 3Gb computer gives you 99.983% of the memory you paid for. Install more expansion cards in the computer, each of which is likely to eat some MMIO space for itself, and you'll lose a bit more memory. But you'll have to try pretty hard to lose even one whole megabyte. I, for one, am OK with that. But things get worse above 3Gb. Large areas of the memory between three and four gigabytes are cordoned off for system devices in exactly the same way that chunks of the Upper Memory Area were purloined in the old days. Once again, the processor (and other system components) can talk with some devices by reading and writing memory addresses up above 3Gb. The difference is the size of the reserved areas. 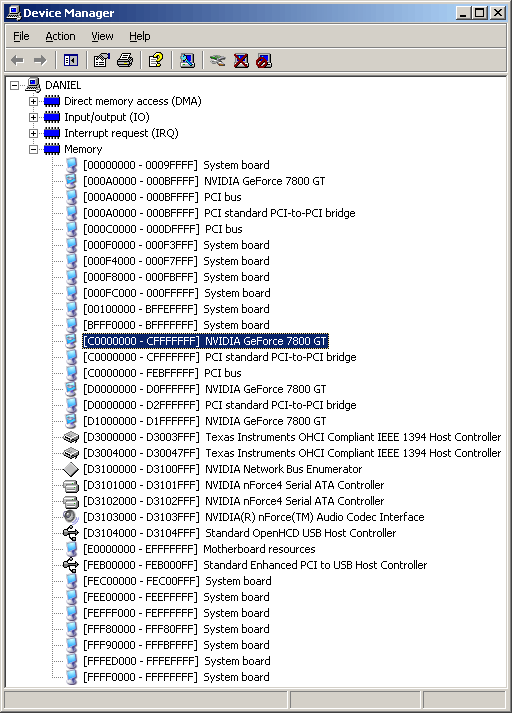 Windows users can see all of the reserved memory areas on their PC in Device Manager, using the View -> Resources By Connection option. This is what that view looks like for the PC I'm using now. The addresses are all in hexadecimal, which makes it less than instantly obvious to the untutored viewer which reserved areas are tiny (and usually old) and which large (and all relatively new). Spend the time to figure it out, though, and you can see the old backward-compatibility stuff and the new 3Gb-barrier stuff, plain as day. 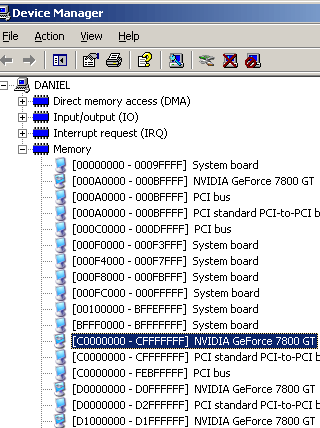 Hex addresses A0000 to BFFFF, for instance, are still assigned to the video card (a GeForce 7800 GT, in this case). That's addresses 655360 to 786431 in decimal, 640 kilobytes to 768k. This is the old 128 kilobyte reservation for the monochrome, CGA and EGA graphics buffers, still there in case you find your old Leisure Suit Larry disk and want to see if it works. In the above picture, though, you'll see a much more considerable reservation from C0000000 to CFFFFFFF, that's also assigned to my video card. That's 268,435,456 bytes, equal to the 256 megabytes of memory on the card, and it's the chunk of memory addresses that system devices use when they want to access the card's memory. If I had a video card with 512Mb or 768Mb of memory on it, it'd take up even more space in the 3Gb-to-4Gb memory map. And if I were still using an AGP graphics card, there'd be another block of memory reserved for the AGP aperture, used when devices on other buses in the computer want to talk to a graphics card on the AGP bus. I've got a PCIe graphics card, though, which sits on the same bus as all of the other stuff and so doesn't need an aperture. Power users with a hankerin' for dual graphics cards may be experiencing something of a sinking feeling, at this juncture. Yes, the 256Mb reserved for my little old graphics card means exactly what you think it means: Those two 768Mb graphics cards you can totally justify buying will eat one point five gigabytes of your 32-bit memory map all by themselves, cutting you down to a 2.5Gb ceiling before you even take the other reservations into account. This also explains why 1Gb graphics cards haven't hit the consumer market yet. Nobody yet needs anything like that much memory on one card for any desktop computer purpose, but some people would still be very happy to pay for such a card just for the pose value. It'd eat the whole of the fourth gigabyte of their system memory, though. And then they'd probably demand their money back. As with the Upper Memory Area problem, the 3-4Gb space must have seemed stratospherically far away when people first started buying $15,000 80386 PCs. But here we are running into it, and the result is not pretty. That was then, this is now. 64-bit CPUs are widely available, and 64-bit OSes are starting to trickle into the mainstream market. The nightmare will, with any luck, soon be over. A 64-bit PC running a 64-bit OS has a truly vast basic memory address space. The 4Gb 32-bit address space was 4096 times the size of the 1Mb 20-bit space, but the 64-bit address space is 4,294,967,296 times the size of the 32-bit one. By default, an all-64-bit PC will still have the standard big holes in its memory from three to four gigabytes. But because the address space now extends above 4Gb, there's the lowest-hassle way to deal with the problem - just install more than 4Gb of memory, and live with the fact that your 8Gb PC with a 768Mb graphics card only actually has seven-point-not-much gigabytes of visible RAM. One advantage of this is that you can still boot a 32-bit OS, if you want to. Another is that this vanilla configuration is most likely to actually work. Cleverer memory configurations aren't necessarily properly supported by hardware, operating systems and device drivers yet. If you don't care about these factors, though, there are two ways to get the lost memory back. Some 64-bit motherboards give you an option for "memory hole remapping". That moves the fourth-gigabyte MMIO memory holes higher into the 64-bit address space, probably way above the maximum RAM you can physically install. Many other 64-bit boards, though, are even smarter, and can leave the memory holes where they are and remap (at least some of) the physical RAM out from under the holes and up past 4Gb. This process is often entertainingly referred to as "memory hoisting", and it used to be the preserve of server motherboards. It's been showing up in more and more desktop mobos, though. And on some of them, the memory-hoisting BIOS setting even works, and doesn't horribly crash the system as soon as something tries to use the remapped RAM. You may only be able to "hoist" the last 512Mb of the 4Gb address space, but that's better than nothing. If it works. I should add a note about the /3GB, /4GT and /PAE Windows boot.ini switches, too, because they often come up when people are talking about 4Gb-plus Windows PCs. They are all useless to you. You do not want them. /3GB and /4GT are config settings for different versions of Windows that tell the operating system to change the partitioning of the 4Gb 32-bit address space so that applications can use 3Gb and the OS kernel only 1Gb, as opposed to the standard 2Gb-each arrangement. They don't help at all with the 3Gb barrier, and most applications don't even notice them, so desktop users lose kernel memory space (and system performance) for no actual gain at all. The /PAE boot.ini switch, on NT-descended Windows flavours, activates the Physical Address Extension mode that's existed in every PC CPU since the Pentium Pro. PAE can also be enabled by the /NoExecute entry in boot.ini, which turns on support for the NX bit which you probably also don't actually want. PAE mode, in its proper form, cranks the memory address space up to 64 gigabytes (two to the power of 36). The computer can then give a 4Gb addressing block within that space - or even more, with extra tricks - to each of several applications. PAE's no good to the everyday 3Gb-problem-afflicted user, though, for two reasons. First, it presents 64-bit addresses to drivers, and thus causes exactly the same compatibility problems as a proper 64-bit operating system. Except worse, because now you need PAE-aware drivers for 32-bit Windows, instead of plain 64-bit drivers for a 64-bit OS. From a normal user's point of view, PAE gives you the incompatibility of a 64-bit operating system when you're still running a 32-bit OS. For this reason, Microsoft changed the behaviour of the /PAE option in almost all versions of WinXP as of Service Pack 2. They fixed the endless driver problems by, essentially, making /PAE in XP not do anything to addressing any more. All versions of WinXP except for the x64 Edition now have a hard 4Gb addressing limit, no matter what hardware you use them on and what configuration you choose. All PAE does in those versions of Windows is activate NoExecute support. Which, once again, you probably don't want. This isn't a big problem, of course, since XP is not meant to be a server operating system. But it's still mystifying to people who try the /PAE flag and can't figure out why it doesn't work. Oh, and just in case you for some reason still wanted to try PAE: It eats CPU time, too. As things stand at the moment (June 2007), the sensible course of action for the vast majority of Windows users buying a new PC is to get a standard 32-bit WinXP system with at most 3Gb of memory. It'll come as close to Just Working as Windows ever does, and you'll be able to use as near to all of the installed RAM as makes no difference, if you don't go totally crazy with your video-card choice. If you insist on buying Vista version 1.0, it's still not a bad idea to stick with 3Gb of RAM and use the 32-bit installation option, because 64-bit Vista needs 64-bit drivers. 64-bit drivers are not necessarily fully cooked, or even available, for the hardware you want to use. Many 32-bit XP drivers work in 32-bit Vista (subject to the limitations I explained back in the first Ask Dan), but no 32-bit XP drivers work in 64-bit Vista. It won't be long before driver improvements and Service Packs make 64-bit Vista into a sensible proposition for people who want a PC with 4Gb or more RAM. Right now, though, there's very little point to it for normal users. Yes, if you install 8Gb of RAM (the artificially-limited maximum for Vista Home Basic; Home Premium can take 16Gb) in 64-bit Vista, you'll be able to use at least 7Gb of that RAM, no matter what. But unless you're using 64-bit workstation/server applications (not just Photoshop), or multitasking a whole lot of big 32-bit apps, or running multiple virtual computers on your one physical one, then the extra memory will only give you a small performance gain. Small enough that if someone steals half of your memory, you may well not notice. Australian shoppers can purchase 64-bit CPUs and motherboards - and RAM to go with them - from Aus PC Market.